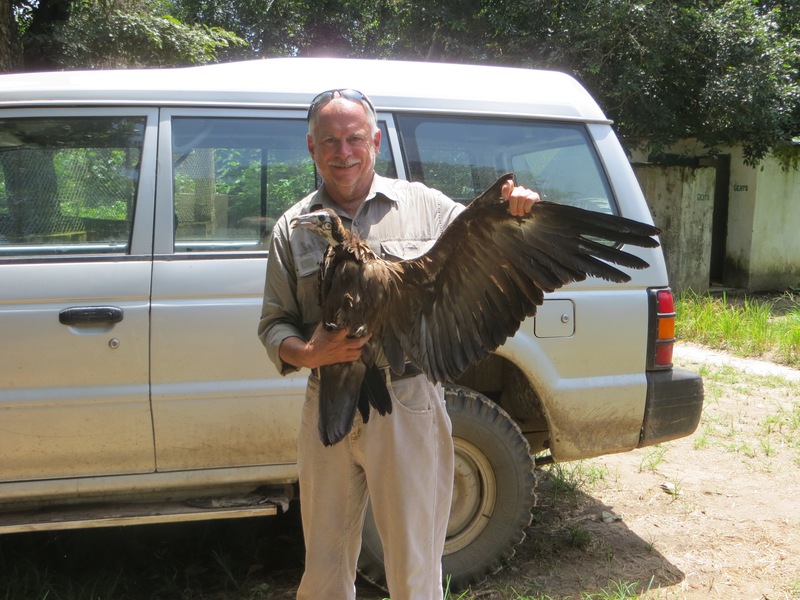 Having recently completed a Ph.D. studying the movement of three of Africa’s threatened vultures – Lappet-faced, African white-backed, and Ruppell’s – in Kenya with the support of Hawk Mountain Sanctuary, I was thrilled to have the opportunity to learn about the movement of one of Africa’s most understudied raptors, the hooded vulture. I tend to think of hooded vultures as the “chickens” of the vulture world thanks to their tiny beaks and small body size. Hooded vultures are unique in that they generally specialize on the tidbits left behind by other scavengers and have even been known to eat the feces of predators and other animals. 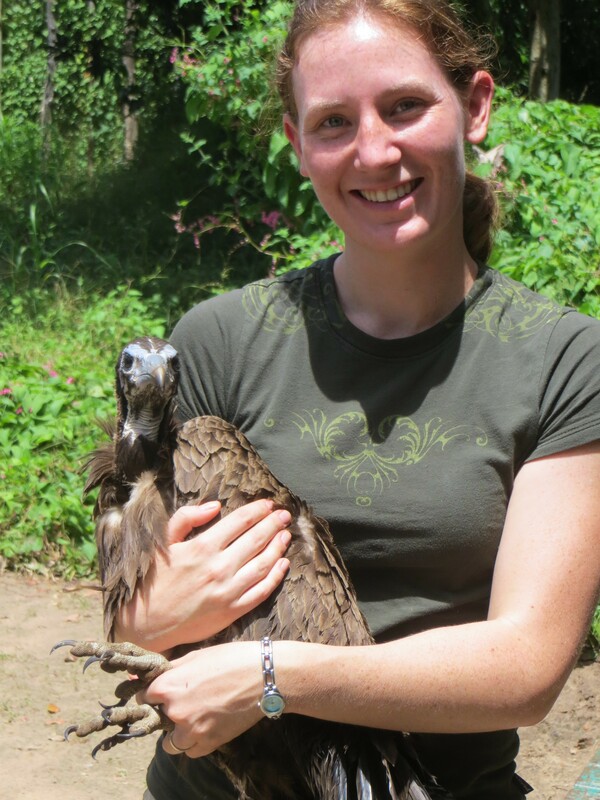 Having only handled a single hooded vulture in Kenya, I couldn’t wait for the opportunity to gain further first-hand experience with these gentle and tiny vultures. So when we caught our first bird, I wasn’t surprised to find that it lay relaxed in my arms while we attached the satellite unit. The juvenile bird was covered in downy feathers, particularly dense along its chest, and had beautiful long eyelashes that it batted gently as it looked up at us. Blood drawn and unit attached, it was quickly released but choose to stick around and stood to take a good look at us before finally flying back to join the impressive number of birds (close to 50) that had gathered in the trees around our bait. 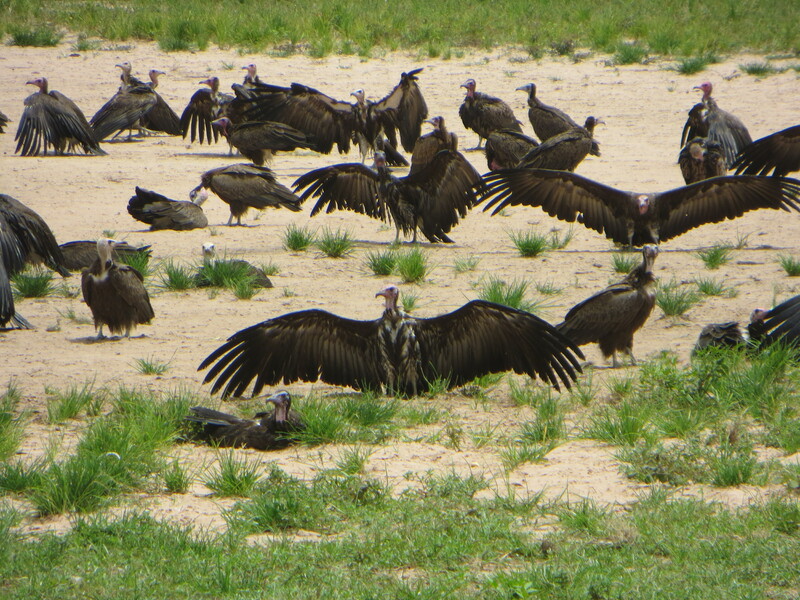 Questions to be answered by this movement study of hooded vultures abound. As someone who has tried to understand how so many species of vultures can live together and why some are more threatened than others, I’m particularly interested to see how they compare to the birds we have previously studied. Hooded vultures are certainly smaller in body size, but does that mean they will have a smaller home range than their larger cousins, like the Ruppell’s vulture, who can travel over 200,000 km2 in a year? In Kenya we have seen the importance of protected areas in shaping vulture movement for other species, but in West Africa where the parks are smaller and more scattered, how will the hooded vultures use the protected area network? 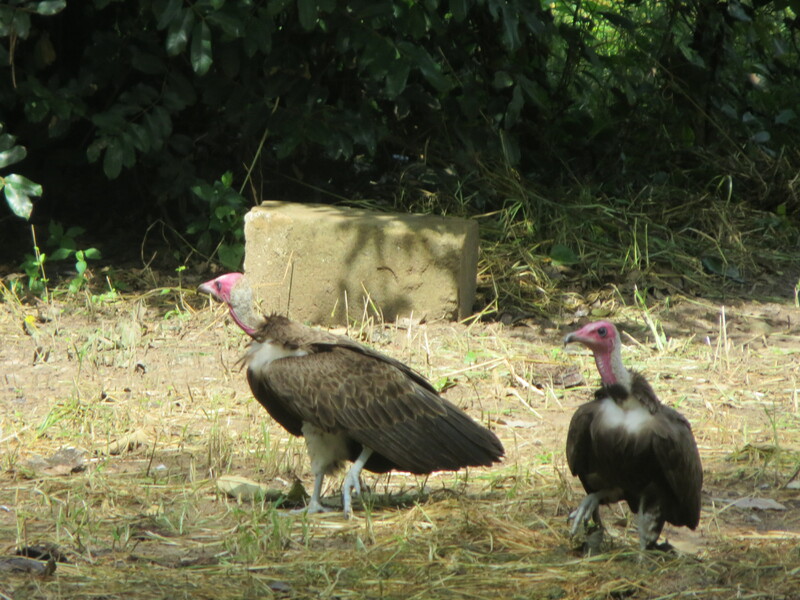 If hooded vultures are spending more time near people in West Africa, as they certainly seemed to in The Gambia, will they have smaller range than they do in Kenya and South Africa, where they tend to be found in more natural habitats? With our first week of data in hand, the excitement is gaining as we gather insights into the habits of these peculiar birds. But only with time, and the help of the four satellite tagged individuals, will we begin to understand what it is these birds need to survive and why they are so much more vulnerable in some parts of the continent than in others.